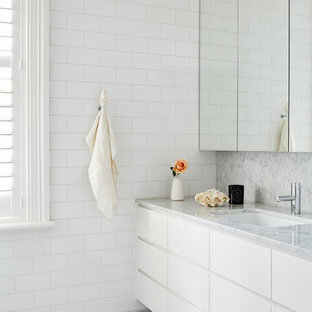 Mid-sized contemporary master bathroom in Melbourne with white cabinets, white tile, subway tile, white walls, marble floors, an undermount sink, marble benchtops, grey floor and flat-panel cabinets. Inspiration for a mid-sized modern master bathroom in Sunshine Coast with white cabinets, a wall-mount toilet, gray tile, porcelain tile, white walls, porcelain floors, an undermount sink, granite benchtops, grey floor and flat-panel cabinets. This is an example of a mid-sized contemporary master bathroom in Melbourne with dark wood cabinets, a freestanding tub, a double shower, white tile, ceramic tile, grey walls, ceramic floors, an undermount sink, engineered quartz benchtops and grey floor. Inspiration for a mid-sized contemporary master bathroom in Sydney with medium wood cabinets, a drop-in tub, gray tile, black tile, porcelain tile, white walls, porcelain floors, laminate benchtops, grey floor, flat-panel cabinets, a shower/bathtub combo and an undermount sink. Photo of a mid-sized transitional master bathroom in Other with a freestanding tub, white tile, ceramic tile, white walls, ceramic floors and multi-coloured floor. 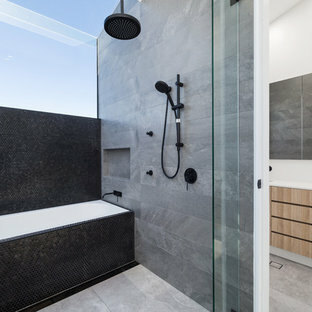 Design ideas for a mid-sized contemporary 3/4 bathroom in Sydney with flat-panel cabinets, an alcove shower, white tile, white walls, black cabinets, a two-piece toilet, subway tile, a wall-mount sink and black floor. 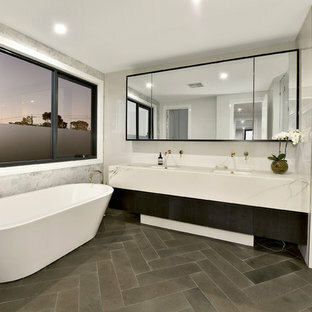 This is an example of a mid-sized contemporary master bathroom in Brisbane with flat-panel cabinets, white cabinets, porcelain tile, white walls, ceramic floors, a vessel sink, brown floor, a freestanding tub, a corner shower and white tile. Inspiration for a mid-sized contemporary master bathroom in Hobart with light wood cabinets, an alcove tub, gray tile, black tile, porcelain tile, grey walls, porcelain floors, a console sink, solid surface benchtops, grey floor, flat-panel cabinets and an alcove shower. Design ideas for a mid-sized contemporary master bathroom in Melbourne with light wood cabinets, a vessel sink, grey floor, beaded inset cabinets, an alcove shower, a wall-mount toilet, multi-coloured tile, stone slab, multi-coloured walls and marble benchtops. 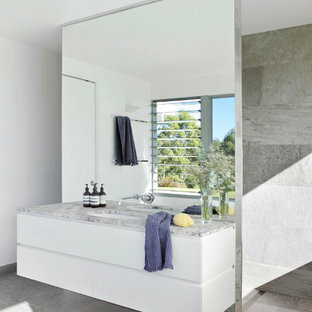 This bathroom is situated on the second floor of an apartment overlooking Albert Park Beach. The bathroom has a window view and the owners wanted to ensure a relaxed feeling was created in this space drawing on the elements of the ocean, with the organic forms. Raw materials like the pebble stone floor, concrete basins and bath were carefully selected to blend seamlessly and create a muted colour palette. Tactile forms engage the user in an environment that is atypical to the clinical/ white space most expect. The pebble floor, with the addition of under floor heating, adds a sensory element pertaining to a day spa. Design ideas for a mid-sized contemporary master bathroom in Sydney with white cabinets, a one-piece toilet, gray tile, porcelain tile, white walls, porcelain floors and flat-panel cabinets. 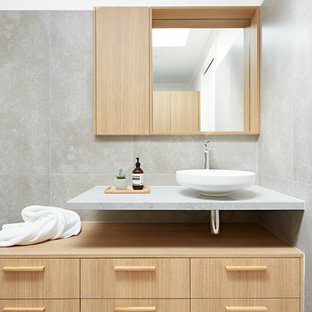 This is an example of a mid-sized contemporary master bathroom in Melbourne with flat-panel cabinets, medium wood cabinets, a freestanding tub, gray tile, white walls, a vessel sink, wood benchtops and grey floor. Photo of a mid-sized transitional master bathroom in Melbourne with white cabinets, a shower/bathtub combo, a two-piece toilet, white tile, an undermount tub, blue walls, marble benchtops, blue floor, recessed-panel cabinets, subway tile, porcelain floors and a vessel sink. new bathroom built into the roof cavity of period home in camberwell. Frameless glass screens around a solid concrete base. Limed timber floors and subway tiles accented by light timber joinery and Essastone bench tops. 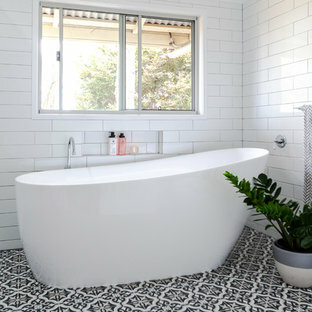 Inspiration for a mid-sized contemporary bathroom in Melbourne with a freestanding tub, mosaic tile floors, white cabinets, an open shower, white tile, mosaic tile, white walls and wood benchtops. 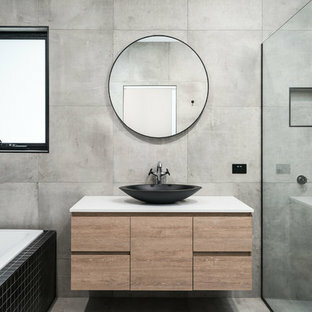 Inspiration for a mid-sized contemporary master bathroom in Melbourne with flat-panel cabinets, white cabinets, a corner shower, a two-piece toilet, gray tile, ceramic tile, white walls, porcelain floors, a vessel sink, engineered quartz benchtops and grey floor. Floor to ceiling tiling with black feature tile wrapping 3 walls and large format tiling on the floor and other walls. 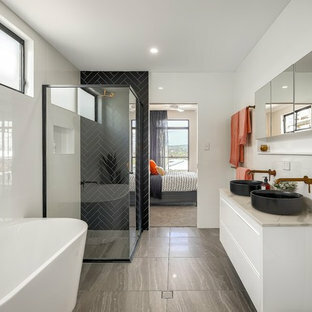 This is an example of a mid-sized contemporary 3/4 bathroom in Sunshine Coast with brown cabinets, cement tiles, a vessel sink, grey floor, a freestanding tub, an open shower and black tile.